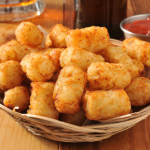 This recipe is the perfect healthy replacement for classic tater tots. With loads of cheese, it still remains low carb and keto diet friendly! Cut cauliflower head into florets. Steam until tender. Pulse in food processor until it resembles mashed potatoes. Let cauliflower cool, then put into a dish cloth and wring out any excess water. Add cheese, egg, and spices. Mix together until mixture is thickened and can be worked with. Add extra psyllium husk powder 1 tsp. at a time if needed. Roll batter into tater tots, then heat oil. Fry 6-9 at a time, flipping as they brown on each side. Lay on paper towels to cool, then serve.